Gandhi, Madan G. Ashes and Embers. New Delhi: Vikas Bharti, 1982. Price: Rs. 100/-. Pp. 50. ISBN: Not Acquired. Madan G. Gandhi strongly believes that “a poem is not a poster, nor a mere social criticism.” “Poetry” for him is “a creative recreation of life in the moments of stark encounters with it.” Ashes and Embers, a collection of 40 poems offers the poet’s ideal and attitude. The title ‘Ashes and Embers’ which is derived from one of the poems of the poetry collection is very suggestive, appropriate and picturesque as it creates an image of ashes that have embers. Ashes exhibit the unfulfilled dreams. The embers or sparks are needed to light the fire to make the dreams true. The poems in this collection exhibit the embers of rebellion in ashes—sometimes in subdued tones and sometimes in forceful tone against injustice. The burning sands, the broken visions, and fleeting fancies possess something fruitful though outwardly speak of the naked reality of failure, despair and frustration. How beautifully he mentions the things that determine themes! It is sad that the destroyer has become saver and the saver destroyer. No Krishna comes to help Draupdi who is robbed by her own relatives with a feeling of pride and honour. The poet reveals the revolutionary spirit when he declares: “I carry both fire and steel / To burn and raze / The weeds and woods.” He knows that Brahma is the only ultimate reality. Hence, he asks for salvation for all. He dreams of an ideal world where all will be free and where exploitation will not be allowed. Madan G. Gandhi uses the colours of patriotism, injustice, revolution, love, realism, freedom, salvation, death etc. to paint the canvas of Ashes and Embers. He has shown his revolutionary spirit in the poems like ‘Revolution’, ‘Second Coming’, ‘The Long March’, Last Symphony’, and ‘Epitaph.’ Poems like ‘Salvation’, ‘Ripeness is All’, ‘Twilight’, ‘Resurrection’, and ‘Second Homecoming’ are religious, mystical and symbolical. He uses scientific terms like ‘radiates’, ‘dissect’, ‘chemistry’, ‘compounds’, ‘mixtures’, ‘molecule’, and ‘particle.’ Terms like lave, thunderbolt, tempest, map, chart, waves, granite reveal his geographical knowledge. His phraseology is appealing and suggestive while his smiles and metaphors are telling and impressive. 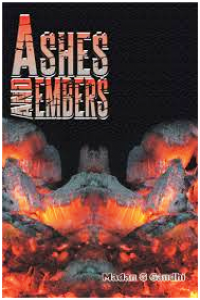 Overall, Ashes and Embers makes a nice and useful reading. The poet moves with a flame and inspires others. He succeeds in his mission of imparting the message. This poetry collection has the spark to ignite the readers who feel with the poet. Here lies the success that counts.